Chocolate. And Love. 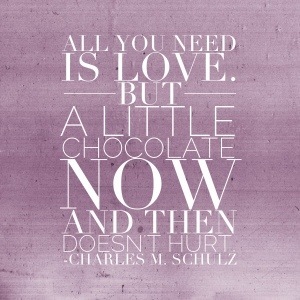 And Chocolate. I remember thinking that was brilliant. I even embroidered that quote on a tote bag to share at our family reunion that year. I got it, but I didn’t really get it. I have always been a vanilla over chocolate kind of girl. At least where ice cream is concerned. And milkshakes. And milk. So yeah, vanilla over chocolate. Until just a few years ago. Maybe I can blame it on Mama’s Texas Brownies that I fell in love with. Yes, IN LOVE. They were the best. But since they had coffee in them too, the results might be skewed. I suppose I could blame it on my Joyful friend who makes brownies with a layer of Hershey bars baked right in the middle. Oh my. Hang on, I need to clean the drool off the keyboard. Wherever the blame lies, I have only just in the past few years become the kind of person who needs (not craves, there is a difference) chocolate on a regular basis. I think it might have something to do with the discovery of the deliciousness of dark chocolate. Sure, growing up I loved Mama’s chocolate chip cookies. She would call us into the kitchen and have us each test a semi-sweet chocolate chip from the bag before she poured them in. I never turned her down. It was for the good of the family after all. When I was in Japan, around the time I gave birth to our Princess, one of the women in my Fella’s flight baked me “The Best Chocolate Chip Cookies Ever.” (Seriously, that was the name of the recipe.) Oh my word, were they ever good. The best. But my need for chocolate did not arrive until that first bite of dark chocolate. Before, I only enjoyed chocolate. Now I was savoring it and thinking about it and well, needing it. So I started buying it. And then the trouble began. There is a great appreciation for dark chocolate with the 18-65 year old members of this household. So much so that it gets real at Christmas when Santa puts the dark chocolate kisses in folks’ stockings. Rest assured there will be no sharing. To each his or her own. And woe be the person who dives into someone else’s stash without asking. Okay, it was more to myself under my breath than out loud where he could hear me, but I think that just might be the truth. Some days are like that. I do miss my chocolate. I look forward to the day I can have it again, and in the meantime, I find myself walking down the candy aisles that aren’t on the way to what I need in the store. I find it fascinating that after all of the years of being a vanilla girl, I have developed an appreciation and affinity for chocolate. Maybe the Peanuts cartoon was accurate all those years ago after all. Tonight I am thankful for the discovery of something new that brings me joy. I give thanks for the willpower to give it up for a bit so my body can do what it needs to do. And most of all, I am grateful for those close to me, both near and far, who share their love. This might sound cheesy (adding in another favorite food I’m avoiding right now), but–as good as dark chocolate is, love is the sweetest thing of all.